Puny Ancus is an Imperial beggar living in the Waterfront District of the Imperial City. You can find his bedroll and food bag next to the Garden of Dareloth and Amusei's bedroll. He wakes up every day at 6am and heads to the Waterfront Lighthouse and strolls around the area for four hours. At 10am he crosses the waterway and positions himself in front of the Marie Elena, trying his best to earn a bit of gold from the pirates in the area. At 2pm he will relocate once again and find himself a spot outside The Bloated Float Inn until he retires to his bedroll at 6pm, grabs a piece of food from his sack and takes a two-hour dinner. After his only meal of the day, he will stroll around his bedroll until he goes to bed at 10pm. His attire reflects his social status, consisting of only a collared shirt combined with belted braies. He also carries his cup and any amount of money that he managed to earn during the day. As a beggar he has very limited combat resources, relying on his bare fists during combat. He is infected with the yellow tick disease, and you may contract it if you fight with him. 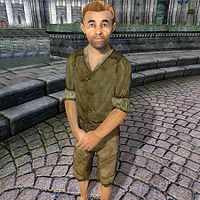 He is one of the few people that can give you the necessary information about how you may be able to join the ranks of the Thieves Guild, and will also aid in some of your jobs for the Guild. He is also one of the "poor and suffering" that you need to speak with in order to receive master training in Speechcraft. This page was last modified on 1 January 2014, at 09:09.